We got to sleep in a bit today as the ferry to Orcas Island didn't leave until 11:30. As usual, the skies were overcast so we were happy to have a leisurely breakfast and relax until check-out time. Heading out of Friday Harbor. One interesting thing on the ferry was a lot of the tables in the lounge area had puzzles laid out for people to occupy their time during their crossing; good idea. The puzzles were not complete and you could work on one until you got off the ferry, and the next person to sit there would add a few pieces until eventually it was completed. Puzzles for the ferry ride. After a brief trip we reached Orcas Island, our destination for the day. There was another ferry at the dock, but it left just as we were pulling in. A ferry leaving Orcas Island. 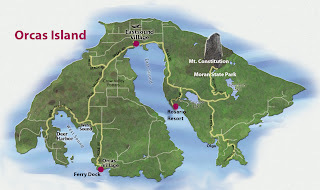 Orcas Island has an unusual shape with the island split by two long sounds up to a backbone of land in the north. Orcas Island is more rural and rugged than San Juan Island. It is very hilly and heavily forested and boasts the highest mountain on any of the San Juan Islands, Mt. Constitution at over 2400 feet. Not very high as far as mountains go, but when you start at sea level on a small island it's pretty impressive. 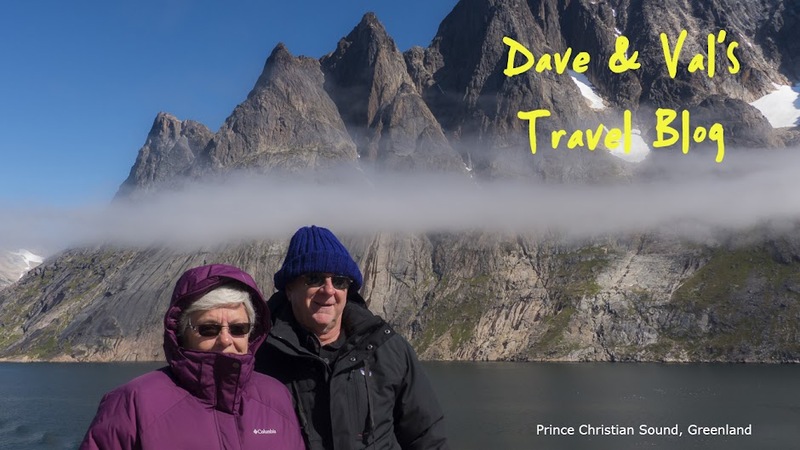 We decided to explore the west side of the island first and headed off to Deer Harbor on the southwest corner of the island. This was mostly a driving tour as it had started raining again. The landscape in this area was rural with beautiful old farms along the road. We next headed north towards Eastsound, the biggest town on the island. Along the way there was a pottery shop that Val wanted to stop at so we went deep into the woods on a one land dirt road to find it. It was in a great location with beautiful views off the west coast. It was a very nice shop with the work of many different potters on display. After making several purchases, we were on our way to Eastsound. We ate a late lunch and then drove on around the east sound to explore that part of the island. This area is sparsely populated, mountainous and heavily forested and very beautiful. The rain continued off and on so our plan to hike to some waterfalls was cancelled, but we did drive around and do some exploring. Even though it was still raining and getting darker, we decided to drive to the top of Mt. Constitution in Moran State Park. The entrance to Moran State Park with golden leaves lining the road. As we started our drive up Mt. Constitution, the fog started to roll in. At one point on our trip to the top we stopped to take pictures and as we watched, the fog almost completely obscured the view. We were told that on a clear day you can see Canada, Mt. Ranier and the Olympic Peninsula from the top, but today was not the day. After taking our pictures and admiring the view, we continued up the mountain, but it was getting late and the fog was closing in so we decided to turn around and headed back to the hotel. Our room at the Inn at Ship Bay. It had a cozy fireplace and a view of the sound. The view off of our deck. We really enjoyed our day on Orcas Island. Even though we really enjoyed San Juan Island, we liked Orcas Island even better. It is more rural with more hills and forest and just a lot more interesting terrain. I wish we had more time here, but tomorrow it's back on the ferry to Anacortes and then on to the Olympic Peninsula.